Many teachers hang on to everything, because they never know when it’ll come in handy. I rarely hang on to anything that I don’t use on a regular basis, since I don’t like clutter, and more of more of my “stuff” is in digital form. 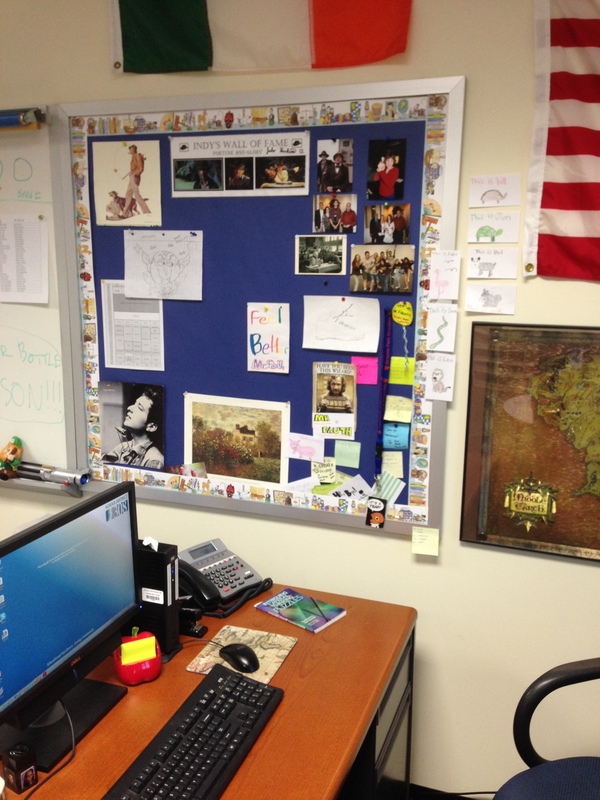 I have hung onto a few interesting objects over the years, though, and along with a few other entertaining bits, I thought we’d take a short tour of some of my classroom. Let’s start with this strange little object. Every year, sometime during the first days of school, I will have several students become obsessed with this object. They immediately think it’s a brain, or guts, and are always surprised to find that it’s just a hunk of hard pink plastic. Any clue what it is? I’ll let it sit there for a while and spark your creativity, and we’ll come back to it another day. 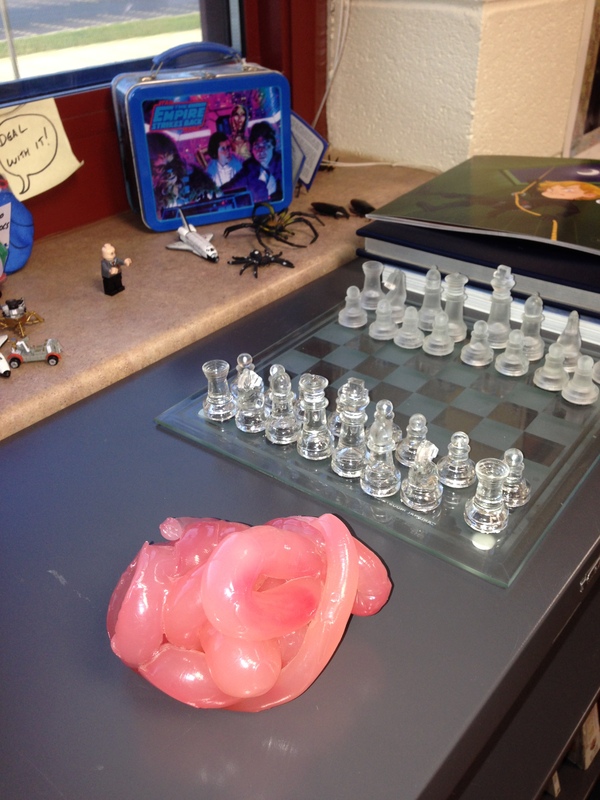 Also pictured: the new glass chess set donated to my room by a very nice family; the replica Empire Strikes Back lunchbox that is exactly the same as the one I had when I was in 3rd grade. Some NASA toys, a “bald” Lego Harry Potter, and of course rubber spiders and cockroaches, because obviously. 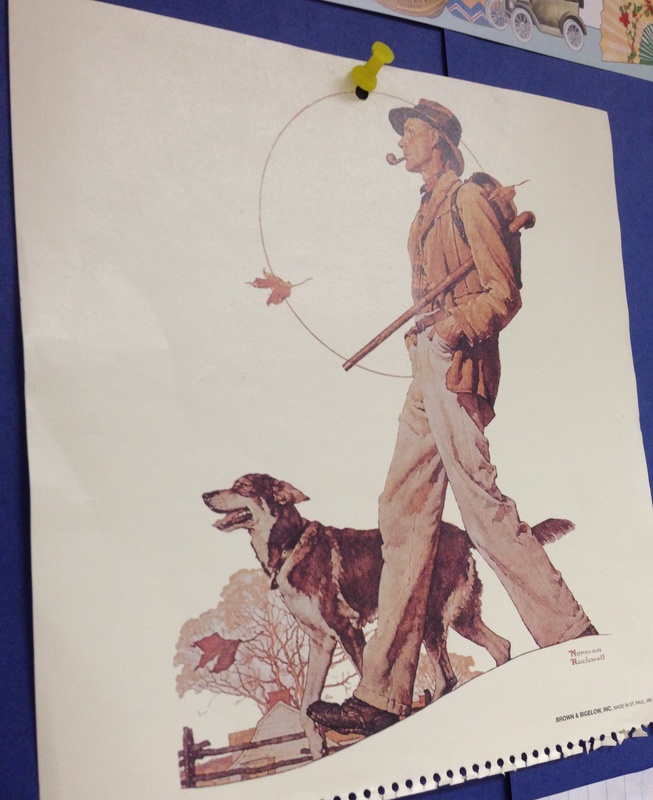 I pulled this out of a Norman Rockwell wall calendar a long time ago. I suppose it sums up me at my most content. Going for a long walk in the cool autumn air. Loyal Dog can be optional. 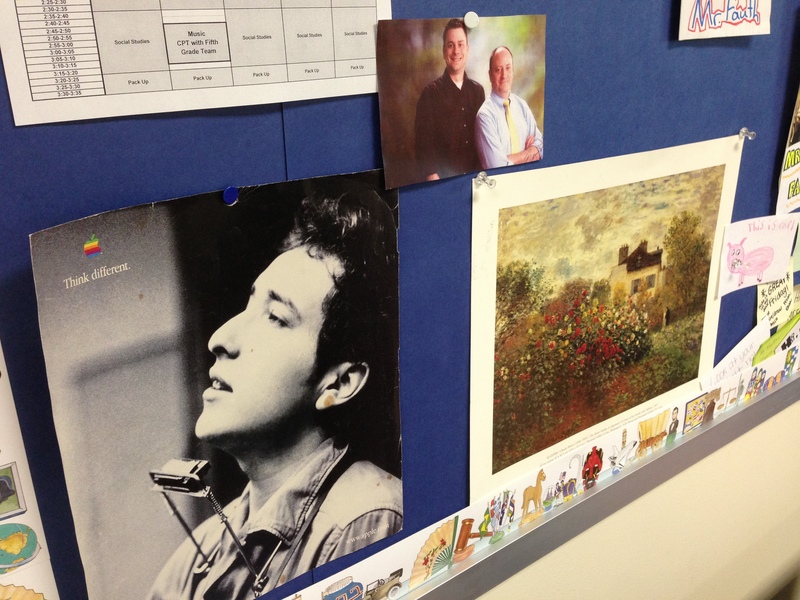 This picture of Bob Dylan was part of Apple’s Think Different campaign of the late 90s. 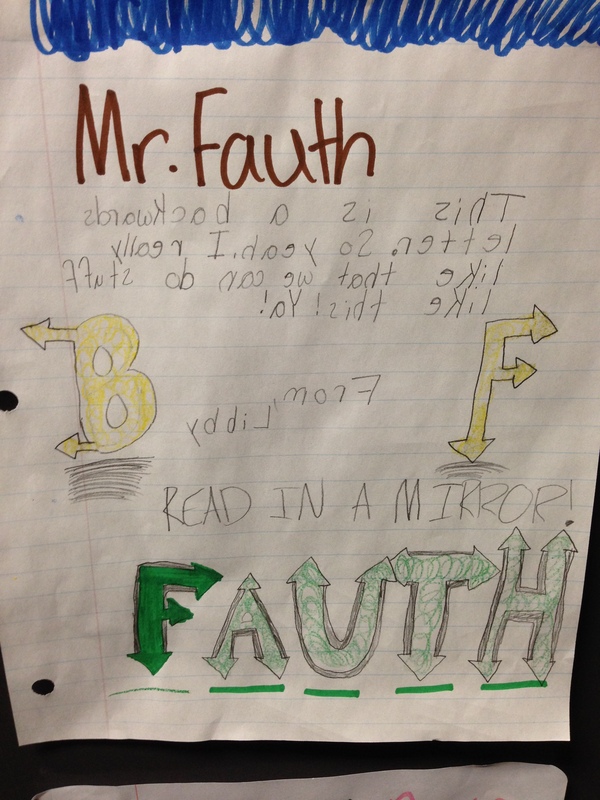 Its hung in my room every year I’ve taught. Above that is the picture Mr. Rainaldi and I convinced the school picture people to take of us as a joke. The Monet comes and goes, depending on my mood. 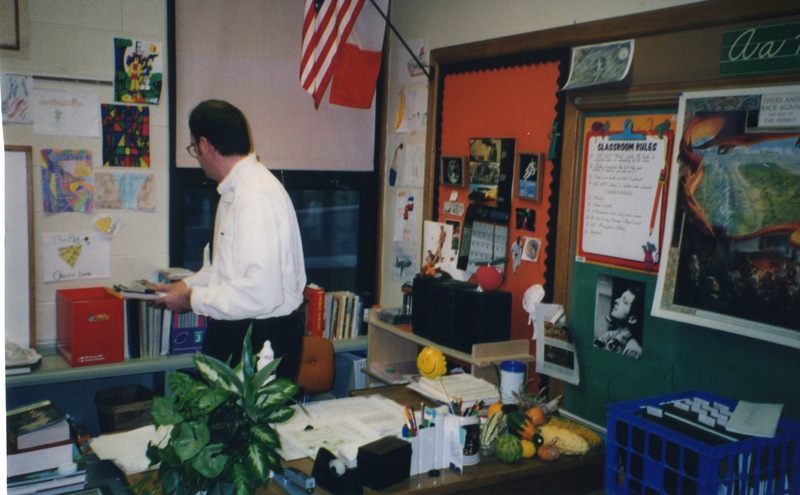 Here’s a flashback picture to my first work area, when I taught fourth grade at East View, and where you’ll find a few familiar pictures. I don’t know who the skinny guy with all the hair is, though. The Irish Tricolor hung in my room all the way back in 1998, before I ever set foot on the island. Note the collection of gourds, indicating that this picture was taken almost exactly fifteen years ago, give or take a few weeks. I think Liz gave most of them to me. And to the left of the gourds is the sweet Princess Leia mug I used to have…until Shane broke it the next year. 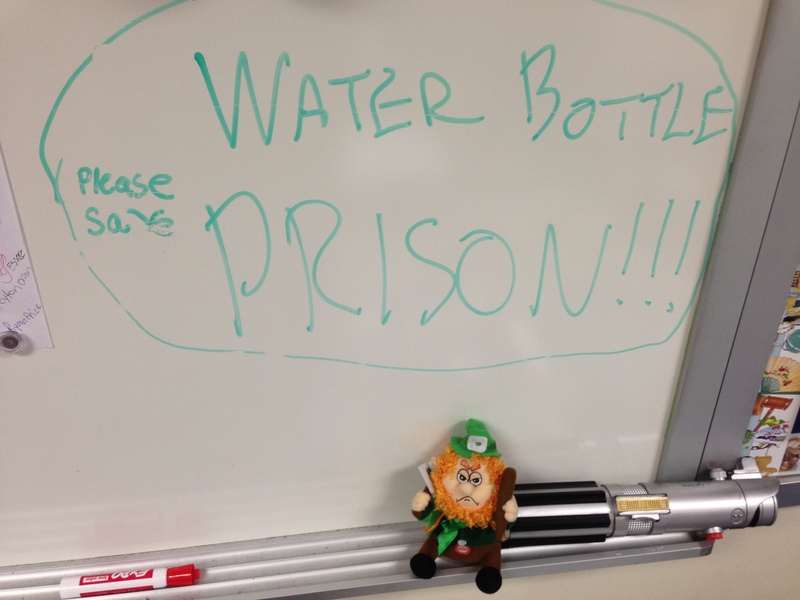 Speaking of the Irish, you wind up in Water Bottle Prison if you bring one of those cheap plastic water bottles and scrunch it at your desk just to make noise and annoy me. It will be guarded by the Irish Stereotype Who Wields a Lightsaber. 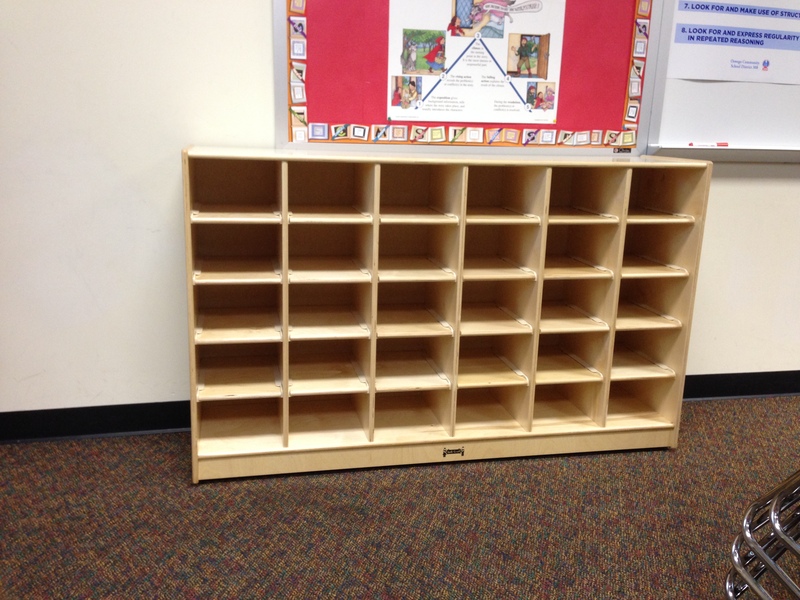 The cabinet is new, replacing a large green cabinet that I had in my classroom every year until now. It was originally built by my grandfather for my aunt, who used to teach first grade in the district. She lent it to me for years and years, and I gave it back to her when I moved to Dublin. A parent was kindly enough to donate this one to my classroom. She’s just happy her child is enjoying school again. And of course, nothing beats 5th grade artwork. Read it in a mirror!!!! I’ll take some more pictures tomorrow and continue the tour then. This is kind of fun.